Does the 2018 Mazda CX-3 or the 2018 Mazda6 Have More Cargo Space? Home » Mazda CX-3 » Does the 2018 Mazda CX-3 or the 2018 Mazda6 Have More Cargo Space? On the surface, this might seem like an odd matchup, but it’s far more relevant than you think. The 2018 Mazda CX-3 is the smallest Mazda SUV model, classified as a subcompact SUV. Meanwhile, the 2018 Mazda6 is the bigger of the 2 current Mazda sedans, classified as a mid to full-size sedan. Both the 2018 Mazda CX-3 and the 2018 Mazda6 have 2-row seating for up to 5 passengers with similar size and power capabilities. Therefore, how similar are they in terms of cargo space? Which 2018 model has the larger cargo capacity, the 2018 Mazda CX-3 or the 2018 Mazda6? There are 2 kinds of cargo capacities. The initial cargo capacity is how much cargo space is available when all seats are in place. This means strictly the trunk space. The maximum cargo capacity is how much cargo space is available when all seats that can be folded down and/or removed are folded down and/or removed. To help clarify, maximum cargo capacities are most often available on SUV models, as many other car makes don’t offer adjustable seating that can be folded down, compressed, or removed. Therefore, most vehicles only have an initial cargo capacity. The initial cargo capacity of the 2018 Mazda CX-3 is 12.4 ft3. Meanwhile, the initial cargo capacity of the 2018 Mazda6 is 14.8 ft3. Therefore, 2018 Mazda6 has a larger storage space in the trunk when compared to the 2018 Mazda CX-3. However, the 2018 Mazda6 cargo space cannot be adjusted, whereas the storage space of the 2018 Mazda CX-3 can be changed. With the 2nd row of seating folded down, the 2018 Mazda CX-3 has a maximum cargo capacity of 44.5 ft3! Looking to learn more information about the specs and features of a 2018 Mazda model? 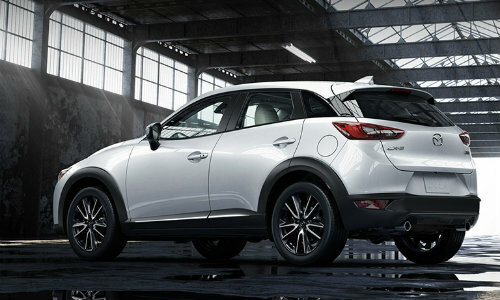 Here at Marketplace Mazda, we have all of the available information on current Mazda models. Feel free to contact us by phone or to visit our dealership located in Rochester, New York within Monroe County if you require any additional help. You can even schedule a test drive with the 2018 Mazda CX-3 and the 2018 Mazda6! 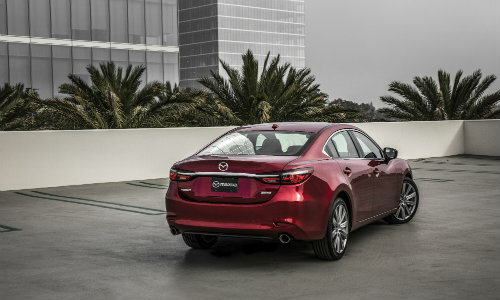 Find which kind of Mazda model best suits you! What are the Upholstery Options of the 2018 Mazda6? What are the Upholstery Options of the 2019 Mazda CX-3? This entry was posted on Friday, March 16th, 2018 at 3:16 pm	and is filed under Mazda CX-3, Mazda6. You can follow any responses to this entry through the RSS 2.0 feed. You can skip to the end and leave a response. Pinging is currently not allowed.